Quickest and finest way to cleanse your skin every day for a beautifully flawless complexion. It's a sponge that contains cleanser! Ideal for all skin types, but especially beneficial for Oily and Combination skin types. 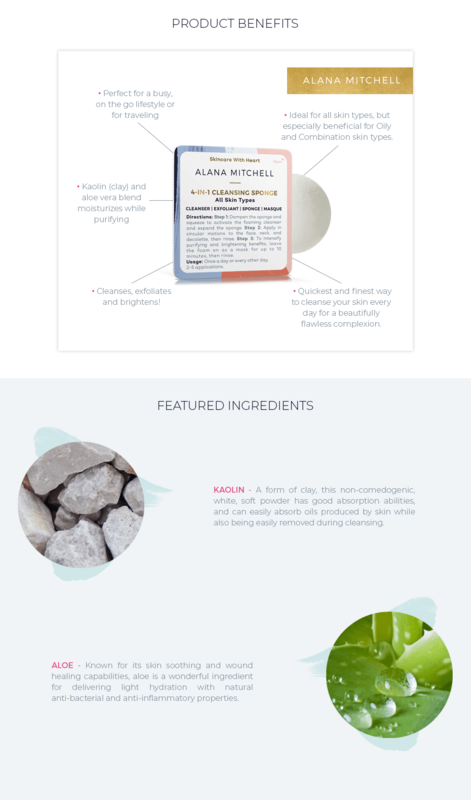 The Alana Mitchell 4-in-1 Cleansing Sponge eliminates the needs for different products, saving you time and money in your skincare routine. It is ideal for all skin types, but especially beneficial for oily and combination skin. The textured sponge gently sloughs away dirt, leftover makeup, and dead skin cells to reveal a clean, glowing complexion. Leave the foaming cleanser on the skin for 10 minutes to receive a deluxe purifying and brightening mask treatment. Featuring vitamin E, the 4-in-1 Cleansing Sponge brightens your complexion for silky-smooth, radiant skin. Step 2: Gently rub the sponge in circular motions on the face, neck, and decolette, then rinse. Use the 4-in-1 Cleansing Sponge once a day or every other day. Usage Amount: Each sponge delivers 2-5 applications.